Designated a World Cultural Heritage Site by UNESO, the region around Central Europeï¿½s largest steppe lake is one of 700 cultural and natural heritage sites in the world. Lake Neusiedl was jointly nominated by Austria and Hungary as a transnational cultural landscape. On the Austrian side, the area of the new world heritage site covers the lake as its core area and the surrounding scenery. On the Hungarian side it extends to the Fertï¿½-Hansï¿½g National Park and the settlement Fertï¿½rï¿½kos. 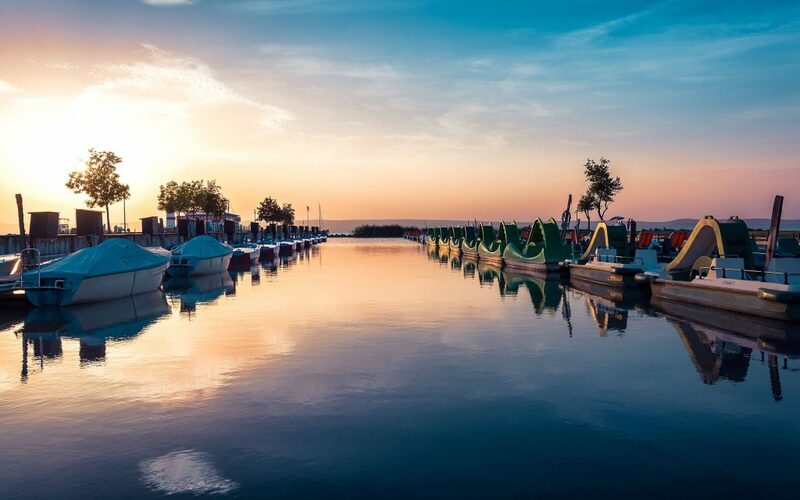 Lake Neusiedl offers countless options for pleasant leisure, gastronomy and sport. Even the wind nicknames the area as primary destination for sailing, surfing, kiting and various water-adventures. The soft landscape with sign-posted hiking trails, fabulous riding tours and golf-courses is also known for wellness centres. Experience Nature: The lowlands stretch across the shallow lake and its vast reed belt. Picturesque villages, lush vineyards and extensive meadows where grey cattle and white donkeys graze, are characteristic of this typical Burgenland landscape in the east of Austria. The Lake Neusiedl-Seewinkel National Park is a unique habitat for fauna and flora from the Pannonian, Alpine and Mediterranean regions. 2000 hours of sunshine per year provide an ideal climate for the growth of fine grapes. A classic for wine connoisseurs, even the non-initiated layman will rapidly develop a liking for a good bottle of wine. First-rate chefs and mouth-watering Pannonian specialities make the region around Lake Neusiedl a mecca of culinary delights. Enjoy the finest holiday attractions and recreational facilities around Lake Neusiedl- free of carge. From 2 April to 26 October 2005, visitors staying over night in one of 700 partner establishments receive the Lake Neusiedl Card, which entitles holders to 40 services and attractions around Europeï¿½s largest steppe lake free of charge! Your hosts wish you an enjoyable stay!